In a garden at Kakamega Forest, western Kenya, October 2016. It is seeking nectar from bougainvillea flowers. Length is close to 20 mm. 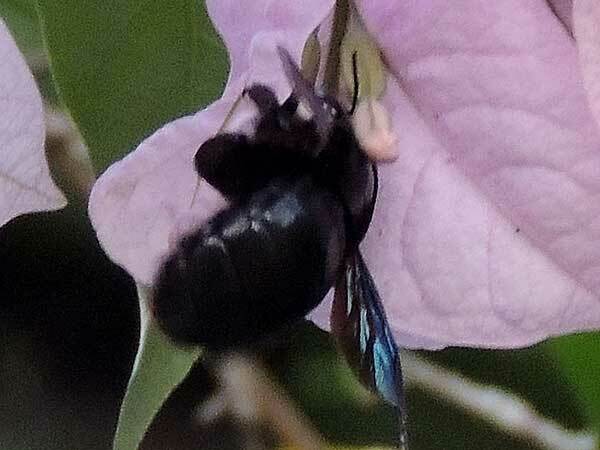 There are many all-black species of Carpenter Bee making specific identification from a photo impossible. Other species have yellow or golden setae (hairs). Carpenter bees are very large (mostly), solitary, and use dead wood in which to build their nests. If they cannot reach the nectar down a long floral tube, they will often resort to chewing a hole in the floral tube: That is what I observed in this case. Copyright Michael J. Plagens, page created 11 April 2017.